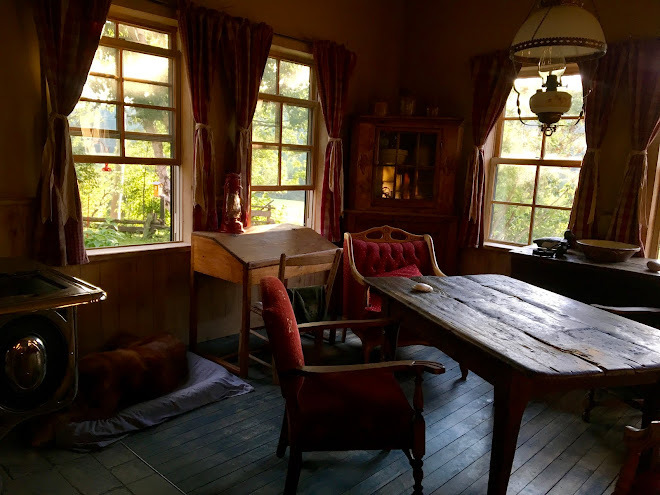 Do our gardens reflect us? I'm firmly of the opinion, that yes, if we ARE gardeners, then our gardens echo us, our interests, plant passions, and style, whether it's naturalistic or formal. 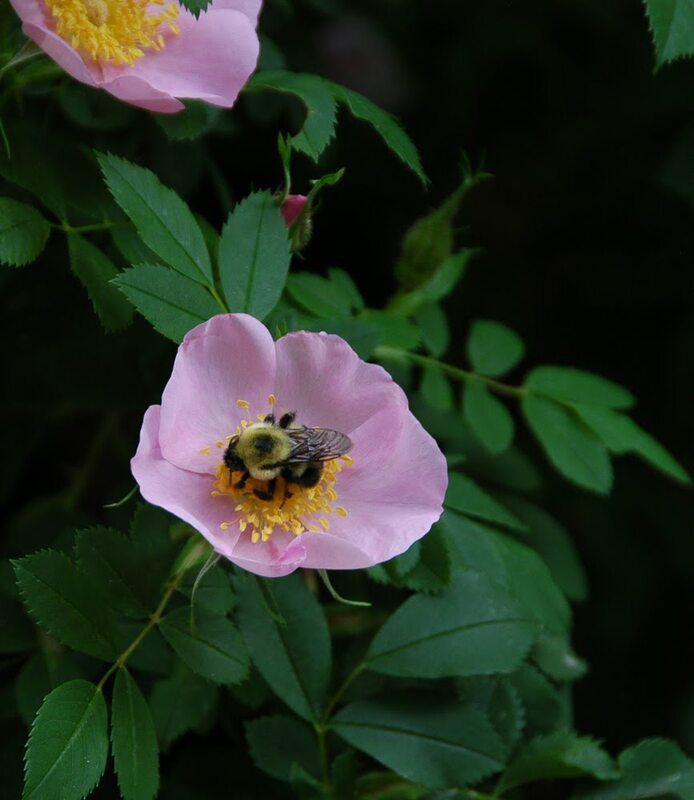 As a wildlife gardener, I feel at home with plantings that mimic natural landscapes, include a diversity of plants (often native, but not always), and provide microhabitats for all sorts of critters. 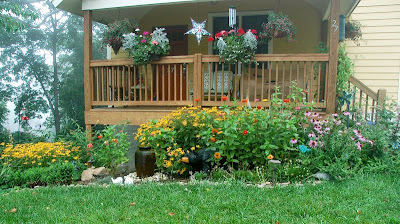 But I also love vegetable and herb gardens and their promise of productivity as well as beauty. Eclectic and whimsical landscapes are also fun; they always seem to reflect the gardener, whether s/he is someone that I ever meet or not. 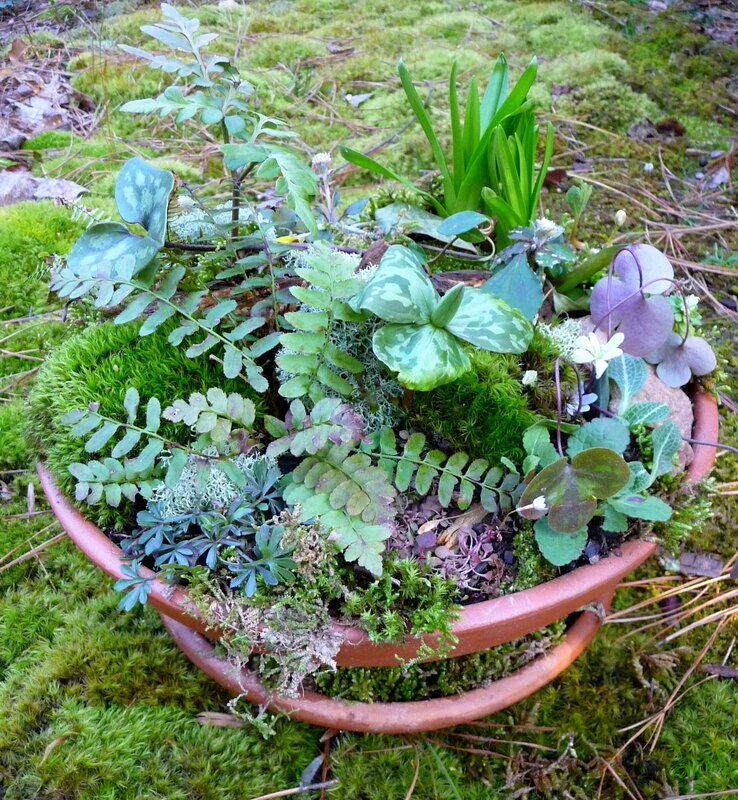 Artists have especially interesting landscapes, if they're interested in using plants as part of their palette. 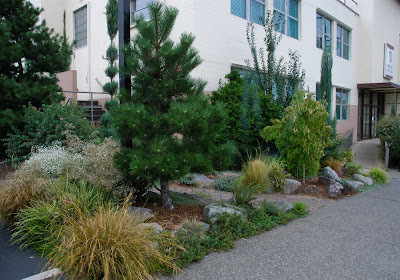 What's missing in so many commercial and public landscapes is any sort of expression of what the landscape is about; there's no sense of place or personality, but simply an assortment of extremely tough plants arranged in unimaginative designs. 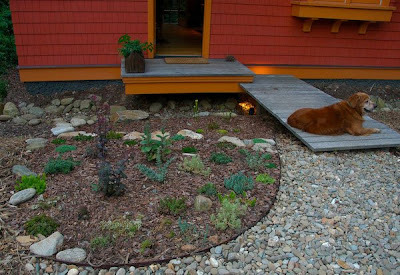 Hooray for gardeners like this one, who have taken a conventional landscape and made it their own! Click on the photo and take a closer look: notice the carved wooden black bear to the right of the fountain. I have a lot of seeds already. Really. This is just one very small bit of my overall collection. I determinedly tried to give away as many as I could in programs and events last spring, but of course, this just allowed me freedom to order more. 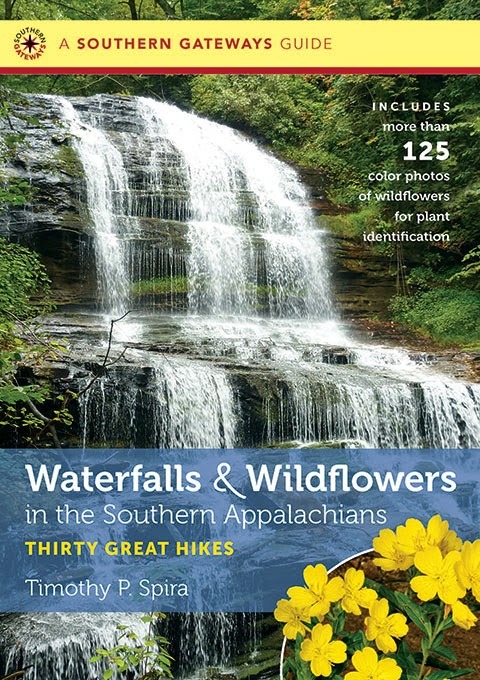 I actually was dog-earing pages in my Territorial Seeds 'winter' catalog yesterday. Hmmm. And my friend CEN gave me a bunch when she moved to a (much) colder climate, so really, I don't need many more for this fall season. But the allure of another perfect winter lettuce variety, tender collard cultivar, a delicious young spinach, and maybe even a tasty beet or two is certainly alluring, especially when woodchucks are eating the squash in the satellite garden, and they're suffering from powdery mildew, in any case. And what about the kitchen garden next to the Discovery Center (the visitor center for the botanical garden where I work) and the participants in fall vegetable gardening programs, and the folks with donated Earth Boxes through our Upstate Locavores network program. 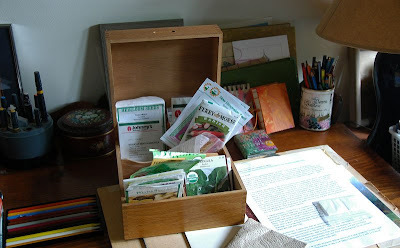 All will need fall vegetable seeds. Or so I'm thinking. It's a good thing that seeds are a wonderfully inexpensive indulgence. I'm really tired of cookie-cutter commercial and public landscapes. It's SO refreshing to bumble on a business with an interesting landscape or a public area that's actually creative and reflective of the surrounding region. 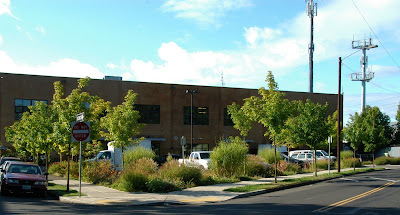 This legal office in Portland, Oregon had a lovely landscape. I've found that there's a bit of synergy that can work in a community. If one business starts to do something different, then their neighbor catches on, just like in residential communities (which can be equally unimaginative). How about this oil change place in Asheville, North Carolina? Up and down this busy street, there are now pockets of truly nice plants, in front of offices, furniture stores, quick check places, etc. Parking lots don't have to be a monoculture. A new bank in my town features an elaborate new landscape of lawn, crepe myrtles, Japanese hollies in rows, and purple-leaved heucheras in full-sun (hmmm). It's a contrast, to be sure, to the nicely developing and diverse 'Gateway Park' put in by the city several years ago. 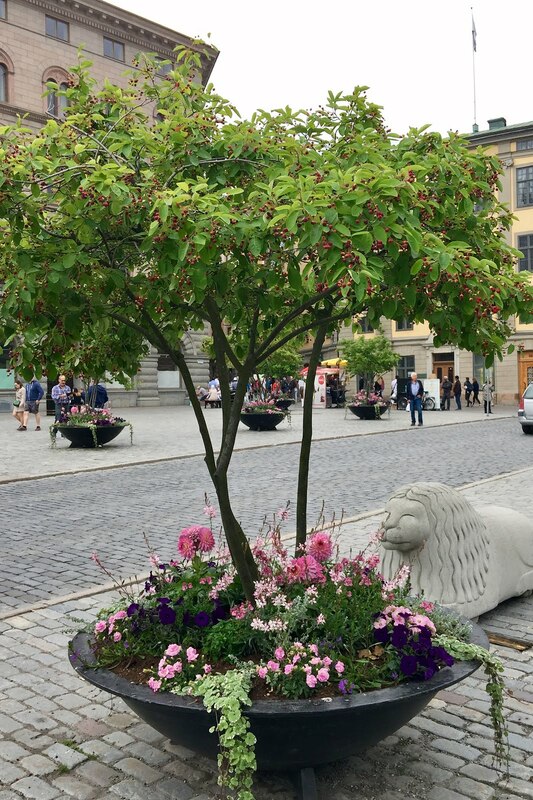 I guess I should be glad that our small city requires landscaping at all, since it does result in green, but I just wish that landscapers (and developers) would be a bit more creative in their approach. I think that landscaping creates a mood that creates a better environment for businesses of all kinds, from banks to groceries to doctors' offices. I know that I, for one, enjoy visiting my current dentist with his dental cubicles looking out into gardens and bird feeders a lot more than previous dentists that I've had. A recent visit to a medical specialist found his office surrounded by lovely plants (several substantial white oaks, very nice shrub plantings, and a recently installed pond that he put in himself). What's not to like about that? Recent travels have found me noticing out-of-the ordinary parking areas and streetscapes, container plantings, and office entrances. Why shouldn't this be more the norm? 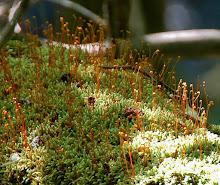 Fresh hardwood mulch is a great substrate for this amazing-looking slime mold. Remarkable in all of its stages, it progresses from a gelatinous yellow stage to darkening crusty stages, all rather alarming in appearance. We had at least 20 different individuals in various stages of maturity on fresh mulch last weekend. 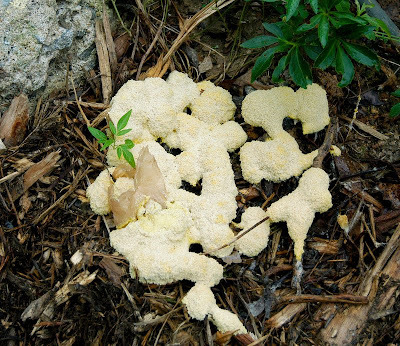 Sometimes called dog vomit fungus, it's a slime mold (Fuligo septica). This informative article in the Chicago Tribune describes its biology nicely. An ancient organism, it's not a plant, animal, bacteria, or fungus, but it's well-adapted to doing what it evolved to do: break down organic matter. I've been admiring vegetable gardens lately. Mine is looking quite nice enough, but is showing the stresses of drought and (excessive) woodchuck herbivory, not to mention dry weather-induced powdery mildew on (non-predated) squash leaves. 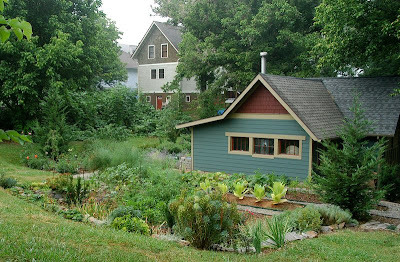 This lovely garden is tucked into a second lot behind a renovated house in Asheville, NC. They've created a studio/shed/office (?) behind their house that frames the vegetable garden. It's delightfully laid out with green metal edges, and Southerners will appreciated the tobacco plants next to the asparagus. 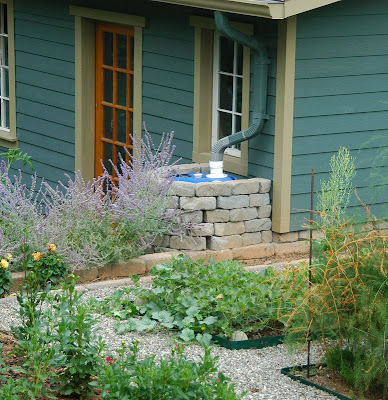 And isn't this rainbarrel cool, screened by an attractive wall of tumbled stone? 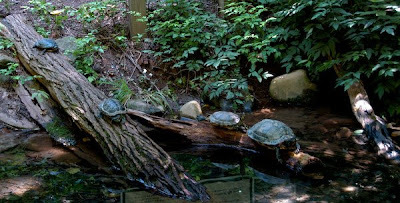 Visiting the Western North Carolina Nature Center for the first time (encouraged by the seasonal butterfly house), we enjoyed an up-close view of some native mammals, reptiles, and amphibians that we normally don't see. 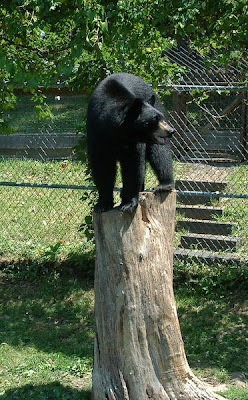 Bobcats, red wolves, gray wolves, gray fox, and coyotes were among them, but our favorites included a very lively male bear (he splashed and played in a large pool with a rope toy, climbed a tree, rolled a log, and clambered up a tree stump). 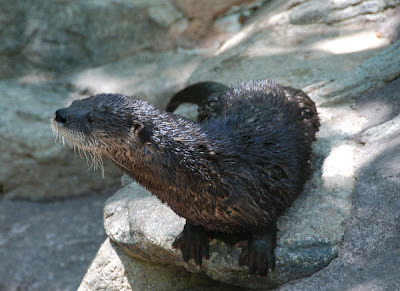 A river otter, waiting for dinner, posed on a rock. The Western North Carolina Nature Center has a lovely small seasonal butterfly house that I hadn't visited before. Displaying native butterflies (monarchs, gulf fritillaries, painted ladies, buckeyes, sulfurs, giant swallowtails, and others), it's a simple, but very effective display. A hoop house, covered with black mesh, entering and exiting through double-screen doors is the basic set-up: inexpensive and nice. Raised beds support a variety of nectar plants and many other donated plants creating a nice border mix. 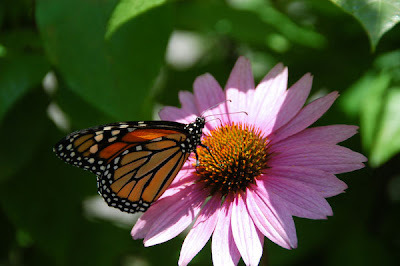 This monarch butterfly benefited from a purple coneflower inflorescence. An outdoor butterfly garden bed completes the display. Great fun, indeed. 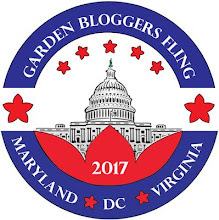 We'll be breaking ground in a couple of weeks for a new Butterfly Garden installation at the Botanical Garden where I work. 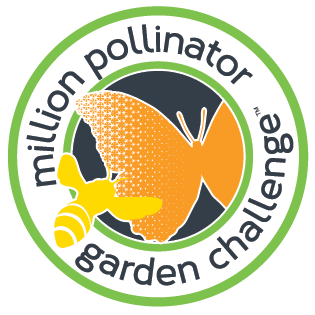 We're excited about adding lots of host plants for butterfly caterpillars in addition to the nectar plants! The tomato plants in the satellite garden continue to thrive. Currently the Sungold, Tomosa, Chelsea hybrid, and Super Marzano (grown from Totally Tomatoes seed) are the most prolific. They seem to be suited to the current droughty conditions, are resistant to the usual tomato diseases that are cropping up elsewhere, and keep growing, flowering, and fruiting. I've got a second round of tomato plants coming along -- from tip cuttings and seedlings. I'll see how the heirloom Black Russian tomatoes fare, along with more Super Marzano and Sungold. Young broccoli, brussel sprouts, asparagus (an experiment), and basil are doing well, too, along with happy summer squash. Who knew there'd be so many this year. Maybe the particularly cold winter zapped most overwintering larvae or pupae of the squash vine borers that are the usual difficulty for summer squash here. 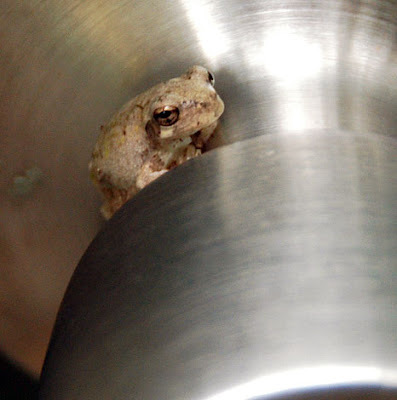 My gardening companion noticed this little tree frog (we think) this evening when he was going to return some tools to the garden shed. He didn't disturb it so I could take a photo (how nice). Adaptable local wildlife seem to be quite happy eating 'local' and enjoying the delicacies that I provide for them. Our woodchuck (quite at home in the brush pile way back towards the woods) is feasting on tromboncino squash leaves, much to my annoyance, but at least s/he doesn't like tomatoes, eggplant, or yard-long beans. Fortunately, there's so much other summer squash this year, thanks to the relative absence of squash vine borers, I can't really complain. (Uh, I do keep setting my Havahart trap, but this woodchuck is much too canny to think that's inviting, even with Chuckster bait). To my amazement this evening, though, I saw a squirrel (again) scampering off down the side fence with a huge radicchio leaf in (presumably her) mouth. She stopped, and started nibbling, but when I came closer, ran off with her prize. 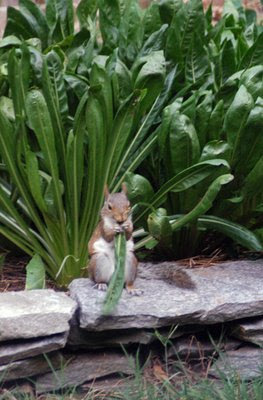 I didn't have my camera, but there was definite evidence last year, and the year before that, I saw this (nursing) female squirrel enjoying a radicchio leaf in about the same spot. Quite remarkable. Our food system in the U.S. is complex. It's burdened with subsidies for production of foods that are perfectly good in their 'whole' state (corn, soybeans, wheat, etc.) but are increasingly difficult to justify in their refined and remixed versions, in the plethora of processed foods available in the average American supermarket. Lots of folks have been trying to redirect this; the last Farm Bill authorization saw a big push to refocus encouragement of industrial agricultural production to at least some support to more locally-focused agriculture. I went to a meeting of a local chapter of the Carolina Farm Stewardship Association this afternoon. It was impressive because of the number of folks who showed up (at least 75 of them): local growers, local eaters, people interested in fresh food, people interested in delicious food, people interested in encouraging kids to eat nutritious food instead of junk, and folks interested in good, fresh food, period. We met in a local historic setting, Farmer's Hall in Pendleton, SC, which has been a gathering place for people interested in promoting agriculture for almost 150 years. It was the gathering point that provided the genesis for the University where I work today. How do we encourage Americans back to eating real food (that is, at least whole food, but hopefully fresh and local food)? I really have no answers, but it definitely would be helpful to eat more delicious vegetables and fruits (whether your own, from the farmer's market, or locally fresh at the neighborhood supermarket). There are always delicious things harvested elsewhere (currently, fresh nectarines from California, for example). Knowing where your protein comes from is a good thing, too. I'm working on trying to be more sustainable in my milk, cheese, egg, chicken, beef, and pork choices. Currently, good eggs are the easiest and most available, followed by milk and cheese. 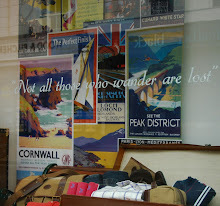 But fish and shellfish require another level of sleuthing to be sustainable. I've stopped buying farmed salmon and shrimp, most wild-caught fish populations are in a downward spiral, so it's hard to justify buying many species of wild fish, whether local or from Asia. Wild Alaska salmon are from apparently well-managed fisheries, so presumably they're OK, but they're an exception. We've been to many distant places well-known for seafood dishes that have not had much to offer in terms of locally-caught fish. Their fishing grounds have collapsed due to overfishing, often because of outside 'industrial' trawling, but just as often from local overfishing, too. I didn't mean to start on an essay about sustainable food, but that's really what I'm thinking about. It rained hard for about 20 minutes this evening, not exactly impressive, but worth a quarter of an inch in the rain gauge. It might have been more, as it came in at a slant for some of that time. Cool(ish) air is colliding with warm moist air as a front moves in. It will bring temperatures in the low 80°(F)s for a few days. Fabulous for mid-July in the Southeastern U.S. Up in the mountains, temperatures will be in the upper 70°s. Some experts think that we're missing the regular afternoon thunderstorms that used to punctuate summer afternoons in the South and Mid-Atlantic states because of climate change. Old-timers around here like to blame the lakes created in the 60's for power generation for changing the trajectory of rainstorms. A young horticulture expert suggested to me that all the storms are moving through the mountains, and not passing through here. Well, that's true, to be sure, but is historically true as well. The Blue Ridge Escarpment, the Blue Ridge mountains, and the Southern Appalachians receive a tremendous amount of rain compared to the Piedmont. 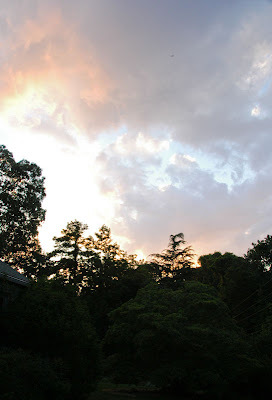 Regardless, in long hot summer dry spells, I'm grateful for rain, and a bit of cool weather. 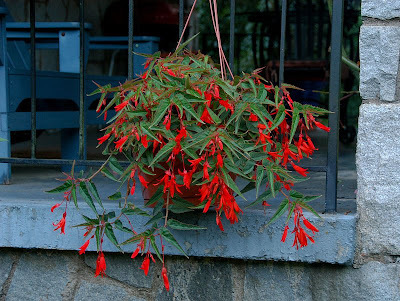 I love this plant (Begonia boliviensis), even if it does trick hummingbirds into visiting it. It's succulent enough to weather our dry summer heat in a hanging basket, and robust enough to grow from quite a small internet-ordered sprig into this lovely specimen within 2 months or so. I tried to overwinter a plant inside a couple of winters ago, with no success (it got very cold in the house over winter break while we were gone that year, but perhaps we overwatered it, too). Last year, my mail-ordered (actually internet-ordered) dormant root/corm/whatever didn't emerge, much to my disappointment. But this year's plant is thriving. 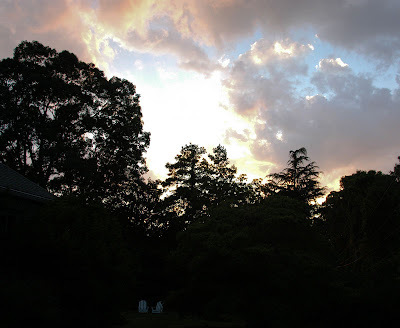 And, warm, sultry evenings have settled in here, although we're supposed to have a respite this weekend. 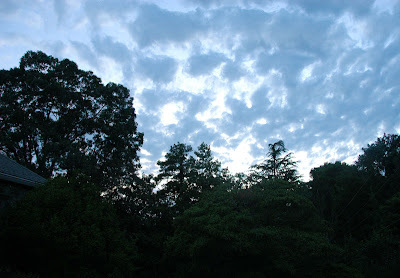 The mid-July sky is lovely, even if it didn't produce a thundershower. In spite of the dry summer so far, the main vegetable garden looks lush and the satellite garden looks like a jungle. Yes, I do water, but I try to be judicious and soak deeply (and am thankful that the winter and spring rains have filled the lakes that provide much of our local water supply). Compared to the crushing drought conditions of the last few years, it's basically unbelievable to have so many productive tomato, pepper, and squash plants. (The beans will recover from their slump, and I'll be planting a last round of French filet bush beans tomorrow, thanks to my friend CEN's extra seeds). Her garden was lovely, neat and tidy, when I visited it last week. I couldn't help but think about the contrast as I watered this evening! It's a good thing that a 7 ct chest freezer is being delivered tomorrow, to go in the basement. I feel obligated to do something with all these vegetables, whether it's preserving the harvest or giving them away! 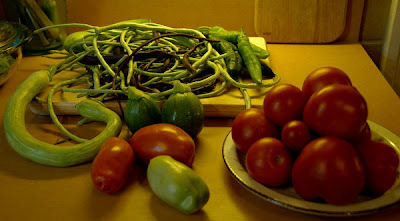 The squash, bean and tomato plants continue to produce. I've never had summer squash in this quantity before; somehow the squash vine borer population is greatly diminished this year, so the Cocozelle zucchini, Ronde de Nice (Eight-Ball), and Summerstick are doing well (in contrast, my tromboncino vines seem to be the favorite of the (currently) resident woodchuck. Tomatoes are ripening rapidly in the dry summer heat; I've been impressed by the Sungold tomatoes -- I love their sweet-tart flavor, and they're certainly productive. A delicious fresh tomato sauce for dinner featured a tomato mix -- yum, with fresh squash as a side dish, of course. The beans are taking a rest. This was a harvest from last week! Tomorrow, I'm going to begin sowing broccoli and brussel sprouts seeds, and maybe a bit of experimental Pac Choi, for transplanting in 4 weeks or so, in mid-August. I'll also try a first sowing of fall carrots and beets, along with more basil and summer lettuce. It seems nuts, but now's the time to do it. 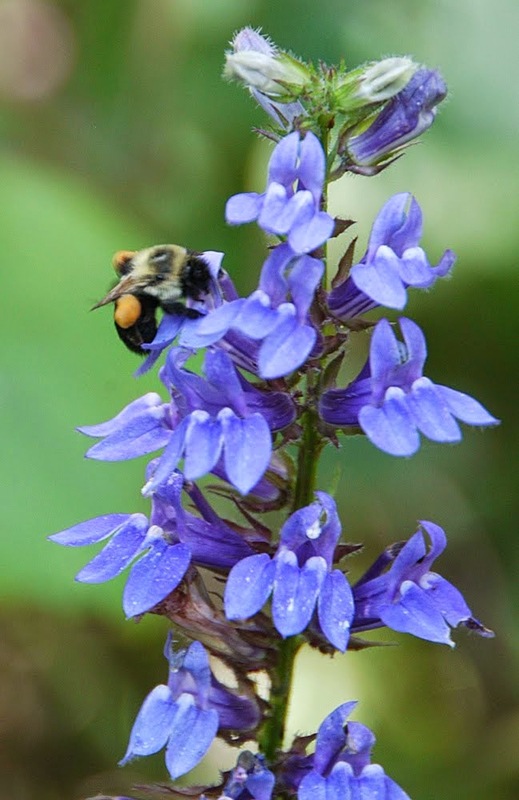 Normally, I think of encouraging toads, woodpeckers, box turtles, chipmunks, dragonflies, butterflies, and owls as a desirable consequence of creating wildlife habitat in our gardens. Seed-eating birds of all sorts enjoy visiting feeders, of course, and hummingbirds readily slurp up sugar water. There are plenty of adaptable critters, too, that are well-suited to suburban life and can be pesky (think skunks, opossums, and squirrels). Much to our surprise, though, just before lunch, an unexpected visitor discovered the black oil sunflower seed feeder outside our small house in the mountains. 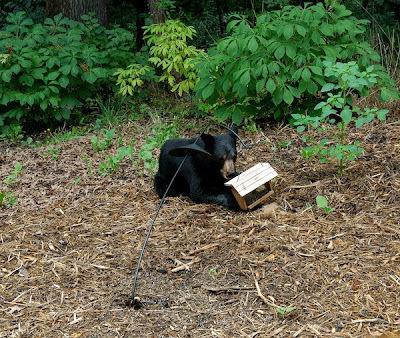 It didn't take long for this young Eastern black bear to bend down the feeder pole (I should have bought the cast iron one, not the aluminum one) and deftly help himself (probably 'him' not 'her') to the entire contents of the feeder, mouthful by mouthful. There is a heavily wooded ravine below, but we're at the highest point, and there's not much of an obvious wildlife corridor from there down that would seem to support a foraging young bear. 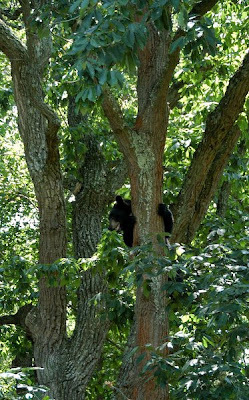 And even though we're in the mountains, we're also within walking distance of downtown Asheville, hardly bear habitat, I'd think. But calling to check, the City's philosophy is to take down feeders (at least temporarily), secure garbage cans, clean grills, etc. Quite reasonable, I thought. 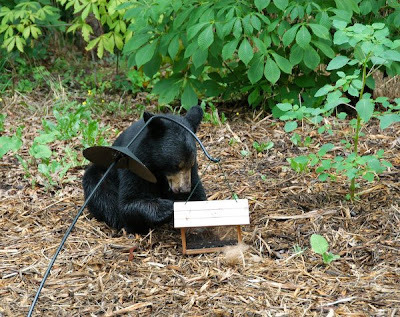 I never imagined that a 'city' (to us) bird feeder might attract (even a young and hungry) bear. Our small sedum planting and pitcher plant bog are doing well. 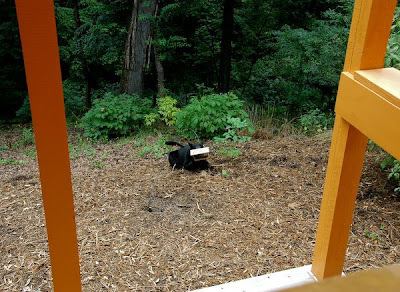 They reflect our urge to plant and transform mulch to green, even if our mountain space is focused on rejuvenation and we look into a forest towards the back. These plants seem to be thriving with intermittent summer rain (so definitely they're low-maintenance so far). I'm going to submit a landscape plan for the front getting ready for fall planting (it's required because of the historic district location). Uh-oh. My gardening companion admired some exuberant perennial plantings this morning in the flower garden at Biltmore Estate (Joe-Pye, Rudbeckia lacianata, a beautiful rose-pink Monarda didyma selection, pink Asclepias, along with a deep pink butterfly bush, and many other things, and said 'could our front yard look like that?' Hmmm, I'm not sure that we're willing to apply the water to make that happen but I can create low-water use perennial beds, for sure. How much green do you need? I know I need a lot. 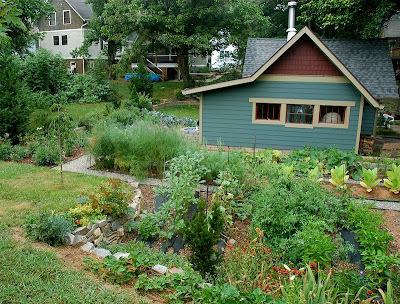 Visiting with a friend today, who's looking forward to a move to a wonderful area that has a summer-growing climate (unlike our practically four season one), she said that she might be quite happy in a condominium or a townhouse, if she could grow vegetables in a community garden. This was premised on being surrounded by easy access to public green space. It's totally appealing, to be sure, especially with LOTS of green space, natural or created. 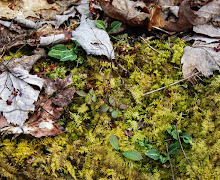 In a previous research life, I studied the biology of weedy species, partly I think, because I was so impressed with the plants that persisted in 'waste' areas, along sidewalks, next to buildings, and popping up everywhere. I noticed this first as a young teenager visiting New York City and then in urban spaces in the Bay Area. 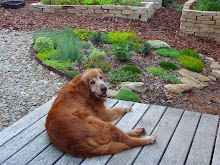 Our goal was to convert the lawn to natural landscape -- with diverse habitats, layers, etc. It's been rewarding so far, after 15 years, and the transformation continues. 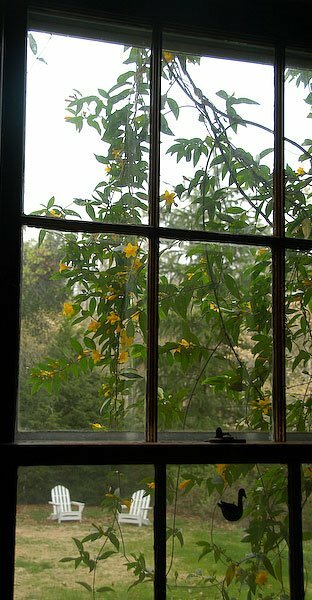 Our first house had a wonderful landscape, clearly nurtured by gardeners, and didn't require much of us, except to enjoy the yellow carpet of ginkgo leaves in the fall, the beautiful display of deep rose azaleas in the spring, and the camellias in the winter. I planted (inexpertly) a few fruit trees and tulips (in a rectangular bed) and we put in a picket fence to surround the backyard (for our old boy - he was a young pup then - Mocha's predecessor). But vegetable gardening wasn't particularly on my radar, although I was interested, nor did I have time (but I was inspired, however, by a young woman who created a delightful Children's Vegetable Garden project - still going strong- at the emerging botanical garden there and a couple of older faculty members who had giant traditional southern vegetable gardens). Our small mountain place provides another challenge. 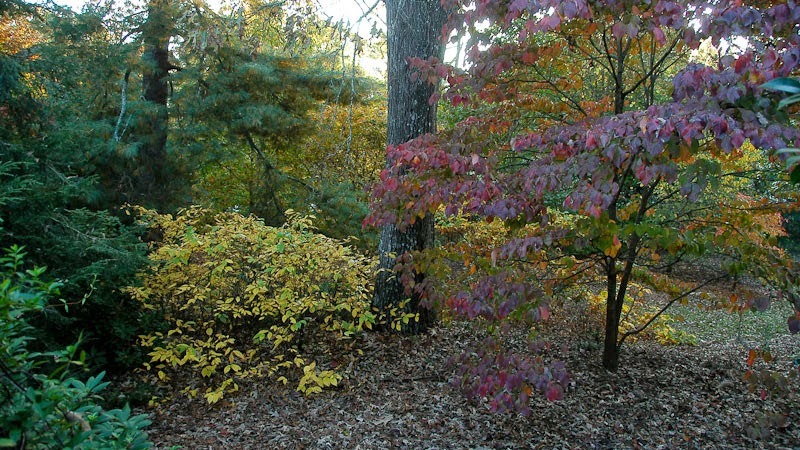 A mulched, low-maintenance landscape is great, but makes us itch to plant things. We need green. And nurturing plants is a good thing. I was totally bemused this morning listening to an episode (via podcast) of Ken Druse Real Dirt. 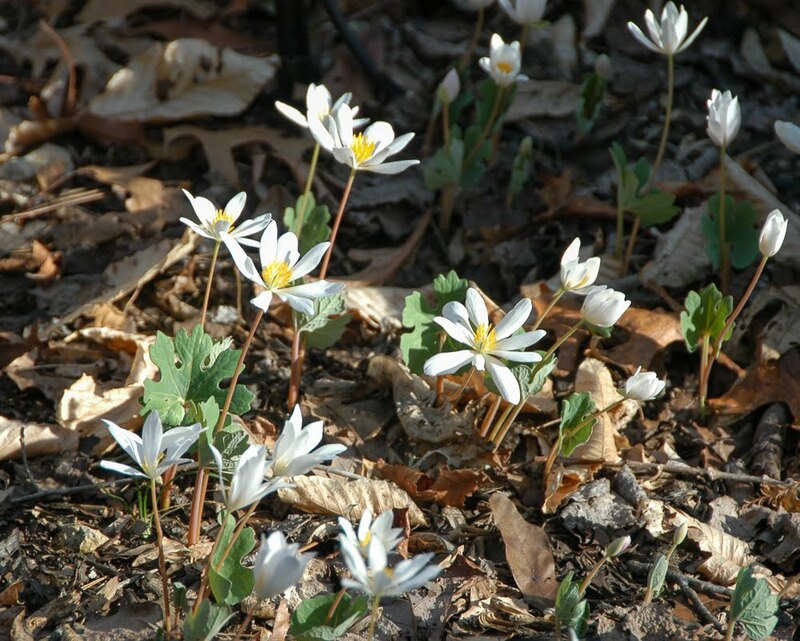 Druse is a fabulous garden writer, photographer, and excellent plant person. 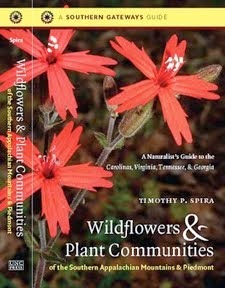 His books about natural habitat gardening were some of the early celebratory books about the beauty found in native plants. 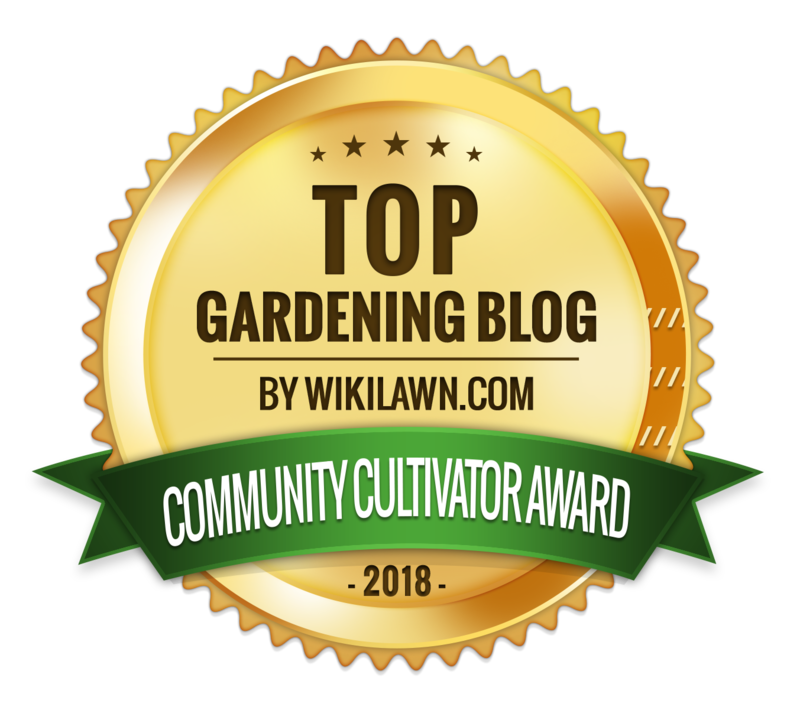 But he's never been a vegetable gardener to any great degree, nor had his guest on this podcast, Susan Harris, one of the bloggers on Garden Rant, a gardening coach, and a sustainable gardener. But what amazed me was their discussion about whether a vegetable garden can be attractive. 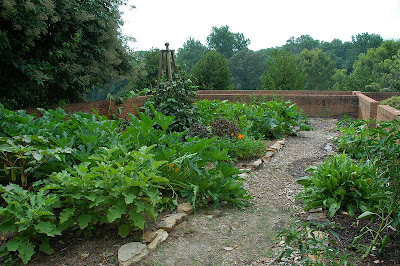 They did talk about Chanticleer, which apparently now has a wonderfully interesting vegetable garden. I'm a great fan of our natural landscape plantings, but I'm also extremely fond of my vegetable garden, and I think it looks pretty darn nice year-round even in the middle of winter when it's only Tuscan kale, winter bor kale, and red bor kale, punctuated by garlic shoots. Now admittedly, I live in Zone 7B, but really? 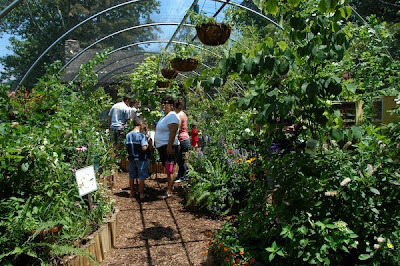 Their excuse was that Rosalind Creasy, the wonderful gardener who started the Edible Landscape trend in the U.S. over 20 years ago lives in Southern California. 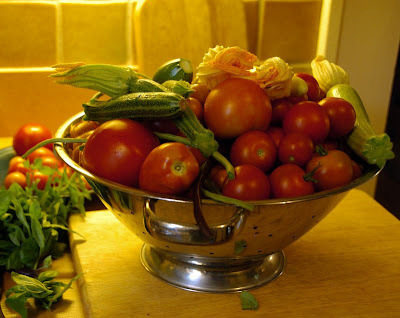 (Her book Cooking from the Garden, was one of my early inspirations, way before I was a serious gardener, vegetable or otherwise; I guess I was a cook before I was a 'real' gardener). Ken lives in Southern N.J. and Susan outside of Washington, D.C. 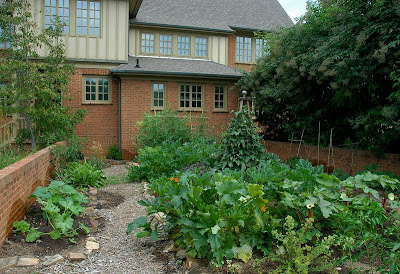 There is no reason that a three-season vegetable garden in either of those places wouldn't look perfectly nice, at least if it's laid out attractively (not mini-farm rows, although those are good-looking, too, in summer). I spent the morning volunteering in the kitchen garden next to our visitor center (at the botanical garden where I work). We've converted it to a four-season vegetable garden. It's lovely right now. After a wonderfully wet spring, the spigot has turned off. We haven't had anything more than a sprinkling of rain since early June. I'm trying to deeply water the vegetable garden at least once a week (and avoid the temptation to water a little bit every day), but it's hard to keep up, with high afternoon temperatures and sunny days. The goldfinches, brown thrashers, squirrels, and others are depending on the bird bath for water, while the mystery woodchuck is becoming more interested in well-watered squash leaves. It's hard to be too annoyed; there's certainly no succulent fresh growth out there, aside from what's being watered. The U.S. drought monitor is still showing that we're OK (that's good) and the long-term projections are fine, so this is just a normal LONG droughty spell. 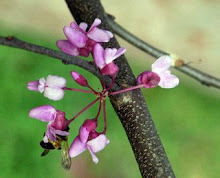 But definitely even native drought-tolerant plants that have been recently added (perennials in the last year, and shrubs and trees in the last couple of years) and all of the water-dependent vegetables and container plants need water. Field crickets are singing loudly tonight, clearly in great numbers based on the volume. I can't say it's melodious, since it's basically one call over and over. But it's remarkably loud, and it fills the night, so we're surrounded with warm humid air and the shu-shu two note calls, over and over. It's the sound of southern summer nights in the Eastern U.S. 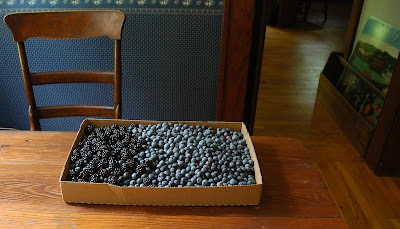 I went with friends to pick blueberries this morning - a perfect Fourth of July outing. We weren't alone. A favorite u-pick berry farm in the foothills of the Blue Ridge mountains has acres of blueberries and blackberries to pick. There were families of all sorts there and the parking areas were full. It was nice to see! We've had a female hummingbird at our feeders and visiting Monarda and Lonicera flowers for some weeks. But eating lunch on the porch today, we were excited to see a pair of hummingbirds circle up and then down, and then disappear on the ground. Woo-hoo! Checking out All About Birds (Cornell Lab of Ornithology), Journey North, and Operation Ruby Throat, it seems promising that this was the final courtship ritual prior to mating, so maybe we'll have a hummingbird nest & babies in the next few weeks. Here in the Southeast, we apparently can have double broods, so maybe our pair will be producing one of these! This is a lot more garlic than it appears! I brought in the garlic that's been drying in the garden shed this evening. It may be overly 'cured' but it's a great harvest nonetheless. I notice that I thought it was overly dried last year too, and it stored beautifully, so it may be just right! 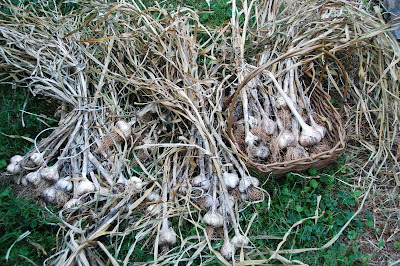 Last year's garlic lasted through January or so, and this looks like enough to get even garlic lovers like ourselves through many delicious meals. A side note: it was fun to search for garlic references on older posts! We do really enjoy our garlic. 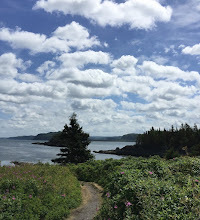 I need to create a menu of posts on the sidebar (but, hmm, that does sound a bit like some work), and it's summer, after all. A tremendous thunderstorm in the North Carolina mountains last night was a surprise. It wasn't in the forecast, but the rain was welcome there. June was dry in the Piedmont and mountains, and the lush spring green is starting to look crispy around the edges. The mountains are doing better than we are in the Piedmont, however; we haven't had any rain here for about 3 weeks, with temperatures well over 90°F for some of that time. Coming down the Blue Ridge Escarpment towards home today, I was wondering how my vegetable garden had fared. Happily, the tomato and pepper seedlings in flats in the shade were fine, thanks to a friend checking on them yesterday on a 'emergency' basis, and everything was OK, although dry. 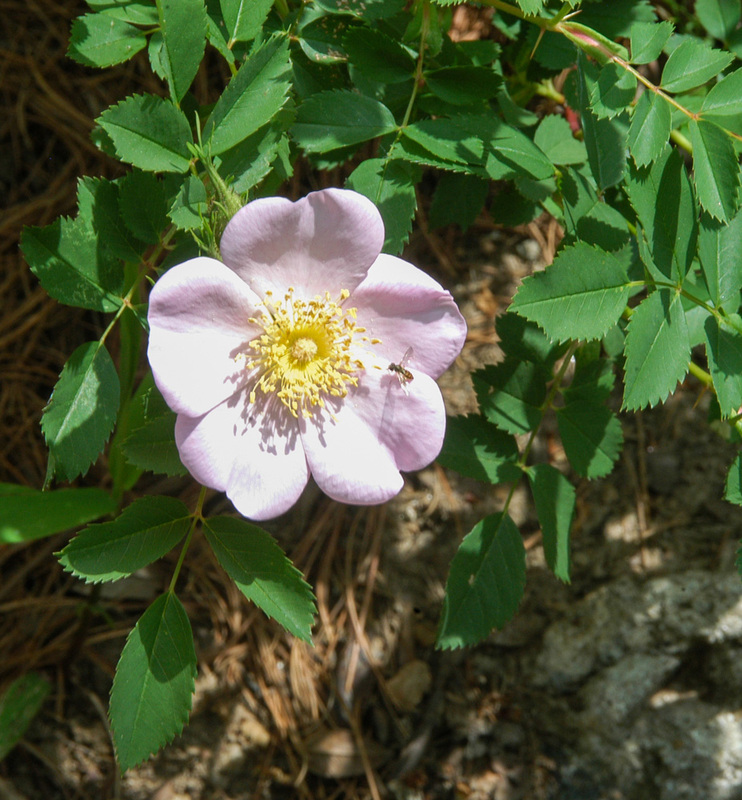 The brutal drought years of the last decade (and especially the last three years) have made me wary of planting anything that's not drought-tolerant, and able to withstand hot, dry weather without visible stress. But, now even the deep-rooted meadow plants are looking droopy in the afternoon, especially the ones planted last year. They're in full direct sun from late morning until early evening -- a tough site, to be sure.